WAITING FOR COSTELLO: Farrell, Rockwell and Walken in Seven Psychopaths. We’ve waited four years for Irish playwright and filmmaker Martin McDonagh to create a follow-up to 2008’s impressive In Bruges. Now he has returned with a high concept metafictional meditation on violence and screenwriting called Seven Psychopaths. McDonagh’s In Bruges star, and fellow Irishman, Colin Farrell plays Marty Faranan, a Hollywood screenwriter whose writer’s block is seemingly exacerbated by his unaddressed alcoholism. He is friends with Billy Bickle, played by Sam Rockwell, who is a struggling actor that kidnaps dogs from their owners with a view to claiming the subsequent reward for their return. Bickle’s partner in crime is Hans Kieslowski, played by Christopher Walken, whose wife is battling cancer. The dog kidnapping scam is reaping rewards until they take the pooch owned by volatile gangster Charlie Costello, played by Woody Harrelson. Though there are sub-plots in Seven Psychopaths, the principal narrative arc is no more complex than the trajectory of Costello’s furious attempts to reclaim his dog. But it doesn’t need to be. The film is an exploration of the screenwriting process and an examination of the writer’s tendency towards violence. You see, Seven Psychopaths is the name of the screenplay that Marty is working on. He only has a title and, therefore, is working backwards: Marty now needs to conjure his seven killer characters. Luckily for him, he happens to know and encounter quite a few psychopaths in his day-to-day life. This is where Seven Psychopaths enters a metafictional realm, in which the lines between Marty’s reality – particularly the contents of his screenplay – blur with his actual life. As a construct, this set-up allows McDonagh (who, by no coincidence, shares the same name as his main protagonist) a wide scope to flirt with a high concept and afford his actors some razor sharp dialogue. LIVING BY THE GUN: Farrell and Woody Harrelson. And McDonagh has amassed the perfect cast to do his words justice. Harrelson and Rockwell – both supreme masters of screwball characterisations – have never been better. Seeing them on screen together is a joy. Walken reminds us of what a nuanced performer he truly is. He conveys sorrow and acceptance before he even opens his mouth. McDonagh has worked with both Rockwell and Walken on the award-winning stage production A Behanding in Spokane, so it’s likely he penned these characters specifically for them. The characterisation and dialogue plays to both their strengths. McDonagh worked with Farrell on In Bruges, so in this film the director has called on actors who he knows are capable of tuning into his eccentric and dark comic wavelength. Seven Psychopaths will undoubtedly be compared to 2002’s Adaptation, which was directed by Spike Jonze and written by the modern genius Charlie Kaufman. 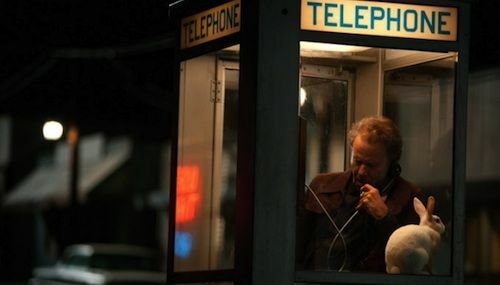 That film used similar metafictional constructs, in which the writer is trapped within his own creation. But McDonagh’s film is far more abstract and prosaic. The director’s strengths as a playwright are evident. Seven Psychopaths echoes of Tom Stoppard’s absurdist piece The Real Inspector Hound. You could argue that McDonagh is encouraging his audience to take on the critic roles of Moon and Birdboot when analysing the madness of his plotting. When the main characters of Seven Psychopaths head to the desert to escape the wrath of Costello, there is a Waiting for Godot-type atmosphere as the three sit around a campfire, hallucinate on peyote and share philosophies. The title of the movie is no doubt an allusion to Akira Kurosawa’s Seven Samurai. To draw a long bow, you could argue that each of the seven psychopaths in McDonagh’s film are, in their heart, using violence to protect something, much like the samurai in Kurosawa’s classic. As a character, Marty is at odds with the potential violence of his screenplay and would desperately love to make a peaceful movie about his seven psychopaths. Yet he is thwarted by his cohorts at every suggestion of a non-violent screenplay. When the Gandhi quote “An eye for an eye will only make the whole world blind” is mentioned – an ideology that Marty is desperately trying to engage with – Rockwell’s maniacal character points out that statement’s flawed internal logic. In that “eye for an eye” scenario there would be a last man standing who still has one eye. A victor. This is a beautifully articulated exploration of not only the futility in wishing for total peace, but also the writing process. These characters are voices in the writer’s head that Marty must endure and placate. The art of writing ultimately subverts any conscious desire – peaceful or otherwise – of the author. McDonagh is well aware that you’re at the mercy of the subconscious voice and its proclivities. 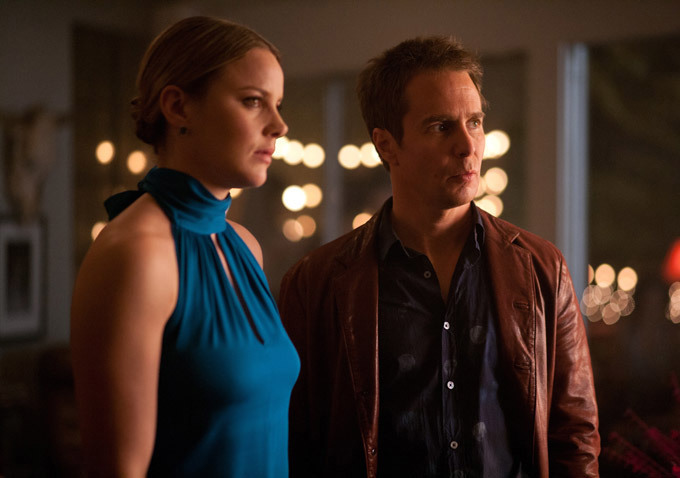 LOCHINVAR’S OWN: Abbie Cornish on screen with Rockwell. Special mention must go to the cast of minor roles. Lochinvar’s own Abbie Cornish is, despite her limited screen time, sympathetic as Marty’s long-suffering girlfriend Kaya, former Bond Girl Olga Kurylenko is gorgeous during her brief screen time, Harry Dean Stanton makes a small, but memorable appearance, and the great Tom Waits is deliciously creepy – and layered – as Zachariah Rigby. McDonagh shares the very dark humour of his brother John Michael McDonagh, who made the brilliant 2011 movie The Guard (which is the most successful independent Irish film of all-time at the Irish box office). Harrelson and Rockwell are both allowed to fly off the chain and they relish every second. And as you might expect, Walken steals every scene that he appears in. He is a true master and you have McDonagh to thank for giving him this idiosyncratic, complex and wonderful character. Seven Psychopaths will be truly appreciated by writers, who can really sink their teeth into an analysis of this movie (much like I have just done). General viewers should be happy to go along for the ride, suspend disbelief and indulge in this deftly crafted and deliciously indulgent black comedy. PHONE CALL: Tom Waits, as Zachariah Rigby, and his rabbit.